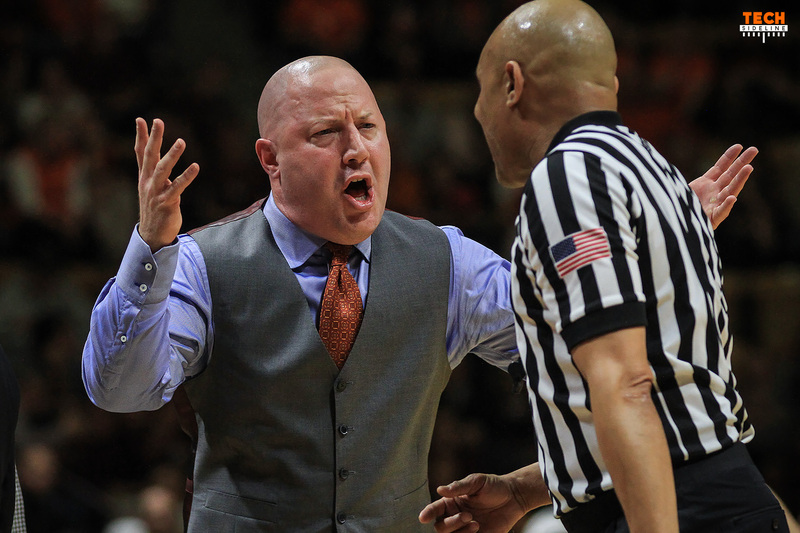 Virginia Tech’s Thursday night game against Saint Louis can be summed up by the comments made by Buzz Williams on the postgame radio show. “I thought we were very much fraudulent in what we want to be about, as a team and as a program,” Williams said. Williams went on to tell the team that he was shocked at the outcome of the game. So was Las Vegas, who had the Hokies as solid 13.5 point favorites on Thursday afternoon. That didn’t matter though, as the Billikens (3-0) controlled the game and beat Virginia Tech (2-1) 77-71 at Madison Square Garden on Thursday night. The Hokies trailed by as many as 12 points in the second half, and though they came back to cut the lead to as little as four points (64-60) late in the contest, it was all for naught. Virginia Tech was undone by several different aspects of the game. In no particular order of importance, here is a list…. 1: The Hokies struggled to stop the ball defensively, allowing far too many shots around the basket, particularly in the first half. Though Saint Louis shot 47.4% for the game, at one point late in the first half they were shooting 55.2%. The Billikens were just 4-of-18 (22.2%) from three-point range, which means they shot a very high percentage around the basket. 2: Justin Robinson picked up his second foul with 17:41 remaining in the first half, and spent the remainder of the half on the bench. He was also knocked out of the game briefly in the second half with an injury, though he returned. Robinson played only 22 minutes, and while he was 9-of-12 from the free throw line, he was 0-of-7 from the field. 3: Tech’s only true center, Kerry Blackshear, also got in foul trouble. He played just 21 minutes, scoring 10 points and grabbing six rebounds. Backup freshman center PJ Horne, who is just 6-5, played only six minutes, which means the Hokies only played 27 of 40 minutes with a center on the court. The remaining 13 minutes were played by wings masquerading as centers. 4: Partly as a result of Blackshear being on the bench for nearly half the game, Tech was outrebounded 43-33. 5: Ahmed Hill and Justin Bibbs combined to go 16-of-25. The rest of the team was just 5-of-27. That includes a 3-of-5 effort from Blackshear. Justin Robinson was 0-of-7, and Chris Clarke was 1-of-7. Clarke, however, did pull down 13 rebounds in 22 minutes. 6: As a team, despite Robinson’s performance, the Hokies were only 23-of-36 (63.9%) from the free throw line. Overall, it was a poor performance from Virginia Tech, who looked very good in a preseason exhibition at South Carolina, and who scored 111 and 132 points against Detroit Mercy and The Citadel in the first two games of the season. There were only three bright spots during the game. First, Justin Robinson’s injury was not as severe as it first seemed. He was helped to the locker room in the second half, but returned shortly thereafter. Second, Chris Clarke had 13 rebounds in 22 minutes, which is incredible efficiency. And third, Ahmed Hill scored a career-high 26 points on 10-of-16 shooting. He was 5-of-9 from three-point range. Highly touted freshman Nickeil Alexander-Walker, who averaged 26.5 points per game in the first two contests, had only four points and was 1-of-7 shooting. The Hokies return to action on Friday at 5pm when they take on the Washington Huskies, who were narrowly defeated by Providence 77-70 on Thursday in a game a bit closer than the final score indicated. The game will be televised nationally by ESPN2. Not trying to be a downer but, jeez, it didn’t take long for this shiny new pair of shoes to get scuffed up. And against a team we should have handled. If we are going to be a heavy driving to the bucket team, and I believe we are, we must improve our free throw shooting to above 75% at least. What do you mean a heavy driving to the bucket team? With 8 mins left in the second half, 4 Saint Louis players had 4 fouls. They only play 7 or 8 players. Only 2 of those 4 fouled out, the first with about 3 1/2 – 4 mins left and the other with less than 1 min left. What we did was drive to the free throw line and kick it out for someone to brick a 3. There is no reason why all 4 of those players shouldn’t have fouled out with more than 4 mins left unless they decided to defend us like we did them and parted the “Red Sea” to the rim. Too many easy drives to the basket with no pick up defensive help. That’s why we need to have big men. They were too physical for us. But ther did have 4 older transfers playing for them. Blackshear lacks lateral movement defensively. Early in the season, hopefully good learning experience. Very disappointing loss. This did not look at all like the team that played the first two games of the season. Very poor play by the team, and I did not sense that the coaches helped matters. They need to treat this like the wake-up call it is, or the NCAA tourney streak will end, at one. Buzz needs to take some ownership for team’s poor play. No defense, offense out of control on many possessions. How can we compete with ACC teams if we cannot handle Saint Louis? Team looked and played as if they were sleeping. Very disappointing performance overall. Coaches better spend their recruiting time finding a big man and I’ve been saying that since Buzz arrived at Tech. Secondly, they need to spend extra time at the free throw line because they were pathetic last night from the line. Left enough points there to have won the game. Seems like in basketball and football we always allow teams to beat us that shouldn’t. Hope they rebound against Washington or the New York trip will be a pure bust! It looked to me that the physical aspect of the game beat Tech. St. Louis looked bigger and stronger and in just about every instance they manned up on us. When the bodies are bigger surprisingly the smaller bodies seem to get more fouls called on them. Definitely a wake up call! What is also amazing about Clarke is that he could have had even more. He didn’t attack the offensive glass when there were clear opportunities. And it wasn’t like he was getting back in transition to stop breaks. He could have 20 Rebounds in his time in the court. They would have been huge. Can point to specifics. They were a step slow all night, and off the mark. I could see them beating this team by a lot of points if they played again later. The lack of free throws made also sealed our fate.Better days ahead. Buzz was out coached, St Louis had a better game plan and strategy. No “Bud Foster like” second half adjustments for Hokies. Then Williams points finger at players in post game comments. I am “shocked” at the head coaches performance. Hope for improvement tonight, Go Hokies. Agree 100%, Buzz talks a whole lot like he’s so much damn smarter than everyone else in the room, and puts out a performance like this? I’m quickly losing confidence in him and CJF…..Go Hokies! Disappointing – just like football. Just another ‘who cares’ team. I couldn’t agree more…………CJF and Buzz come in with all this hype, and they both continue to produce head scratching performances…………just based on actual results, both are highly overrated in my opinion…..Go Hokies! Good riddance to both you and Toledo…go away and never poison these boards with your drivel again. Weekends off to a rousing start!